We are proud to introduce Urban Bistro, a revolutionary new vending service for your business environment. Ever since we began in 1926, the Wrights Food Group has been renowned for producing quality, wholesome food. 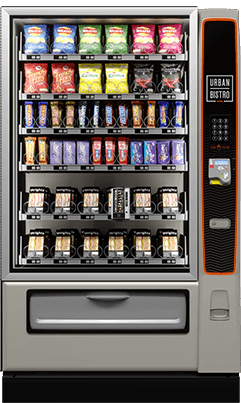 Now combining the extensive Wrights range of delicious fresh food with the nations favourite brands we are redefining the vending experience. Unlike other vending providers we offer a complete end to end solution. Food is prepared fresh by our expert chefs, which gets delivered by our full fleet of Urban Bistro vehicles, all in the same day. With an extensive range of delicious hot snacks and freshly prepared sandwiches, alongside some of the nation’s favourite branded hot and cold drinks and confectionery. Units are monitored around the clock via our active telemetry system, which is fed directly to our highly-trained customer care team, who will manage and distribute product when needed. Our active stock wastage reduction system ensures produce that is close to end of shelf life is automatically reduced to aid sale. 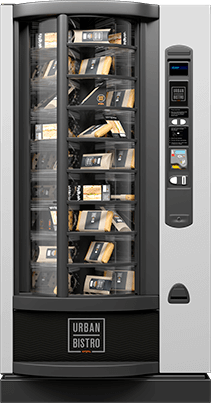 Fully digital and available as modular or singular units, the state of the art Urban Bistro vending machines offer a cost effective alternative to manned cafeterias, without compromising on quality or taste. All at the push of a button. The Urban Bistro range of fresh food service solutions cater for all tastes and times of the day, even when the cafeteria is closed. We offer an extensive range of delicious hot snacks and freshly prepared sandwiches, alongside some of the nation’s favourite branded hot and cold drinks and confectionery. Our around the clock dedicated account management team offer a full end-to-end service. Food is prepared fresh by our expert chefs then delivered by our full fleet of fully refrigerated vehicles, all in the same day. Our active stock wastage reduction system then ensures produce which is near to its end of shelf life is automatically reduced to aid sales. A reliable, hassle free alternative to a manned cafeteria, operating 24/7. An extensive variety of tasty meals and snacks on offer, hot and cold. Around the clock stock and security monitoring provides peace of mind. Fresh food on-site with the assured quality that only Wrights Food Group deliver. 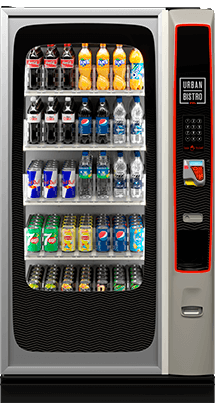 Call 01270 504 300 today to discuss the perfect vending solution for your business. Whether you are already a customer or looking to become one, please contact us with your enquiry and a member of our team will get back to you. Alternatively please see our frequently asked questions below which might have the answer to your enquiry. Urban Bistro is part of Wrights Food Group Ltd. Urban Bistro will only use your supplied details for your specific enquiry. Please agree to one or more of the contact methods below you would like us to use to deal with your enquiry. Who are the Wrights Food Group? Ever since we began in 1926, the Wrights Food Group has been renowned for producing quality, wholesome food. Supplying a wide selection of both sweet and savoury food for both retail and wholesale application we aim to provide our customers with both food and service that is second to none. I don’t have space for a freestanding hot drink machine, do you offer countertop solutions? Hot drinks dispensers are available as both freestanding and popular counter top solutions. Please call +44 1270 504 300 or email sales@urbanbistro.co.uk for further information. Who supplies your fresh food? All of our fresh food options are prepared daily by our own chefs at the Wrights food group. All food and drink including third party brands are supplied and replenished by Urban Bistro. How often are stocks replenished? Live monitoring via our active telemetry system, is fed directly to our highly-trained customer care team, who will manage and distribute produce when needed. Are the machines available as individual units? Yes, all machines are available as single or modular units and can be configured to suit your own personal needs. 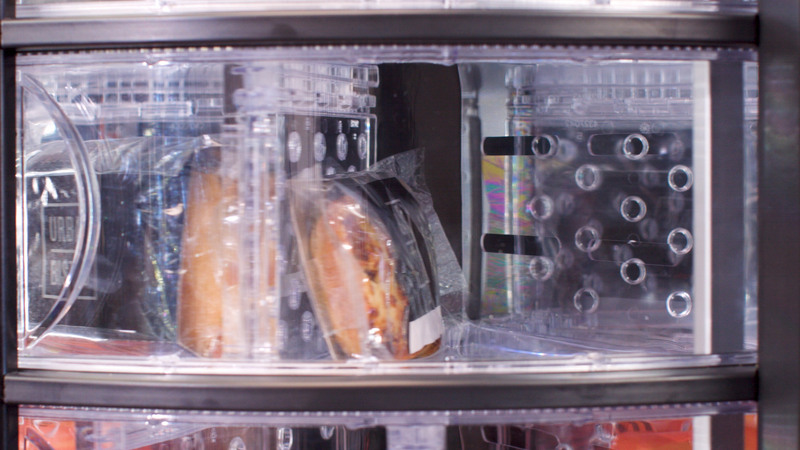 How long will the fresh food last in the machine? Given the nature of the fresh food, these items have a short shelf life, however, our system ensures produce that is close to end of shelf life is automatically reduced to aid sale and prevent waste. Are these vending machines cash only? No, in addition to cash, the Urban Bistro range of machines utilise an advanced cashless payment system, for use with contactless and magstrip debit and credit cards.